The first time I ever touched a gun, I was five years old. 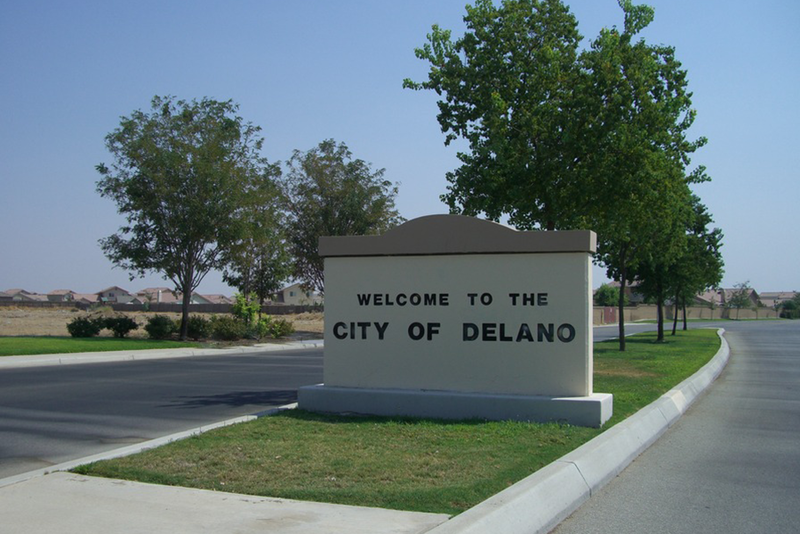 It was 1996, and I was on my parents’ bed in a small two-bedroom apartment in Delano, a speck of a town in the vast, dusty expanse of California’s Central Valley. My father, a Korean immigrant who had landed in the U.S. in the early 1980s, was using a small white towel to wipe an object that glinted in the midday sun that filtered through the shutters. Clambering onto the bed near his knee, I shook my head no. “It’s a gun. Do you remember seeing it in the movies? I want you to know what it is,” he said. I nodded again, and he gently placed the shotgun on our laps as we sat side-by-side. He pointed at the safety, which I learned keeps the trigger locked, as well as the magazine ejection ports, which you need to inspect to ensure the gun is unloaded. He showed me how the pump action loads a shell into the firing chamber, and how to place the stubby stock of the gun into the pocket of your shoulder to take the recoil when firing. I was midway through pumping the (empty) gun when my mother turned a corner and yelped in surprise. But in reality, my mother was too late. Holding that shotgun with my father was the exact moment my love affair with guns and the culture of shooting began. In all, my father owned more than a half-dozen guns and registered for a concealed-carry permit after several run-ins with would-be robbers. By the time he introduced me to one of his shotguns, he’d already defended his liquor store in Delano in a pair of serious gunfights that left the cash register intact but my mother’s blood pressure at an all-time high. He was a stubborn man who had few funds to surrender and even less patience for being a victim. No doubt the 1991 L.A. Riots, during which he watched friends on TV defending their Koreatown storefronts with gunfire, left an impression on him, too. When we moved to Dallas, he registered for another concealed-carry permit, just in case he needed to defend himself while driving around thousands of dollars of women’s clothes for my mom and aunt’s shop at a Latino swap meet. Mandatory military service in South Korea had taught him how to shoot a gun; America showed him how to love it as a value. My dad sold his guns at my mom’s behest by the time we moved to Hawaii in 1997, but I still found opportunities to shoot at the local firing range, pulling the trigger on revolvers, hunting rifles and even a vintage M1 Garand, the main rifle of the U.S. infantry in World War II. During a trip to Vietnam, I rattled off shots from an AK-47 and an M-16 in the humid jungle. And for one semester, I even shot at competitive air-rifle events for my high school, seduced by the physical demands of hitting a quarter-sized target from 10 meters away. Young Michael and Mitch went on to shoot in their youth and as young adults. The latter even took to the family business of selling guns. Larry, 70, and Mitch, 37, are the second and third generations behind Hyatt Coin & Gun, which sits in a big strip mall on the west side of Charlotte, next to a Walmart Superstore and three fried chicken joints. 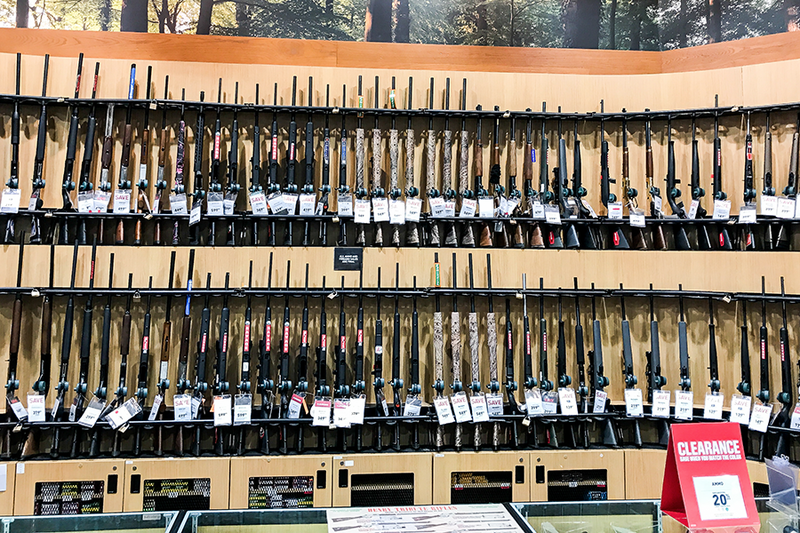 Step inside and your eyes are flooded by bright green pegboard walls, speckled with dozens of AR-15s, Winchester hunting rifles, 12-gauge shotguns and exotic-looking carbines. Hyatt bills itself as the country’s biggest gun shop, with more than 7,000 firearms available for sale, but it’s always been a family business. Larry’s dad, Bill Hyatt, opened the store in 1959, initially with a focus on rare coins. That changed when he met a widow who insisted he take a collection of old Winchester rifles in addition to her husband’s coins. While it wasn’t part of the plan, Bill had grown up in the country, hunting alongside his father, and had served in World War II. A gun was familiar territory. Keeping his son around the business, however, meant training him to use a gun as well. Young Larry’s biggest joy was learning the history of firearms, including studying the German Luger pistol Bill had brought home from Europe after World War II. TV influenced him, too: “It was all Westerns, and you saw the firearms the good guys used, those old Colt revolvers they took care of the bad guys with,” Larry says. Larry took over the business after returning from Vietnam and earning an English degree. Twentysomething Mitch pursued a similar path by working for his father after college. Both have noticed that the vast majority of their clientele is men, who, per Larry, treat AR-15s as much as “hot rods to add lasers and gadgets to” as they do protection. They themselves don’t shoot as much anymore, but the firearm remains an essential link between Larry and his two sons, even if the eldest, Michael, eventually drifted away from the hobby and chose to pursue banking instead. Mitch fondly remembers summer days spent shooting with his father and his friends, and the male camaraderie that flowed from it. I can’t help but think about my own dad when I parse out why I was so in love with firearms of all shapes and sizes. About two-thirds of current gun owners say they grew up with guns in the home, and 76 percent say they fired a gun before they were 18, according to the Pew Research Center. Nearly half of current gun owners who grew up with a gun were younger than 18 when they received their first firearm, and the percentage spikes when looking just at men. As for me, I loved hearing stories about my dad and his guns, including absurd anecdotes like getting kicked out of a range because his gigantic Desert Eagle pistol was too loud and large-caliber. I didn’t get to hunt or shoot with him as a teenager, but a part of me wishes I did. I have a feeling we would’ve bonded as partners out on a hunt, despite our habit of driving each other crazy with stubborn tempers. 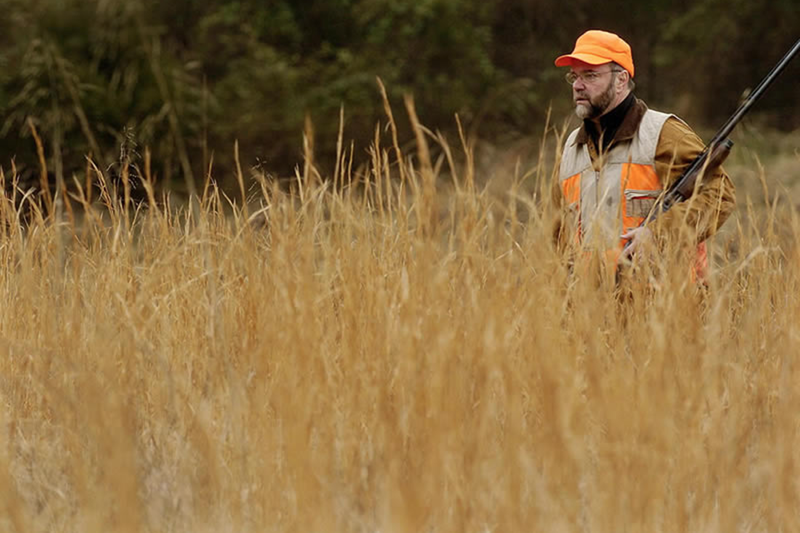 Walt Harrington grew up in rural Illinois as a child, and he’d accompany his father on hunts for rabbits and pheasant, which helped feed the family when they were lean on money. They stopped shooting once they moved to the city when Harrington was 11, however, and it wasn’t until he met his father-in-law that Harrington found himself with a gun in hand once more. It was a beautiful Browning shotgun, intended for a rabbit hunt in the Kentucky countryside where his wife’s family had a farm. Harrington stuck out for a number of reasons, including the fact that he was a white city slicker while his in-laws were black and well-versed in rural life. When his father-in-law handed him the weapon, he knew he was joining the hunt. “I’d gone off to college and grad school and maybe adopted a sort of view that people who hunt for fun might have something wrong with them,” he admits. Hours into the hunt, Harrington was wet from the rain, exhausted and looking forward to going home, not having shot a single round. But on the path back to the farm, fortune struck: The men’s noise rustled a rabbit from a woodpile. In a swift move, Harrington brought his barrel down and shot it dead. The bang startled another rabbit, who fell under Harrington’s aim once more. Later, around a campfire, the men grew raucous while teasing him about his accomplishment and sharing cigars and laughs. Messner thinks he probably embarrassed his father when he chose to stop shooting and be an activist, but his family was supportive regardless. Others who choose to be critical and step away from gun culture, however, find themselves in awkward positions with the men they’re supposed to bond with. 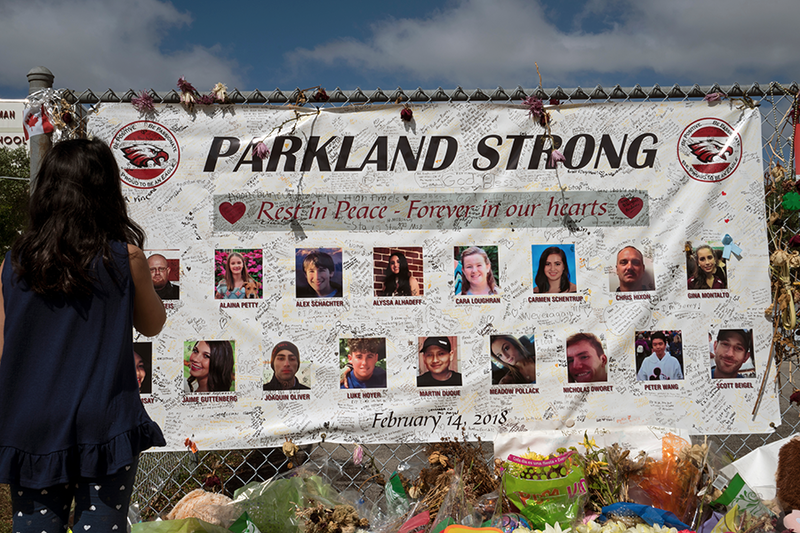 Michael Ferguson, who works in substance abuse and treatment in L.A., also grew up with guns around him and learned to shoot when he was six years old. His grandfather, a longtime rep for gun manufacturer Beretta, was eager to show him the ropes. That morality can become violent in a toxic way, as evidenced in incidents like the killing of Trayvon Martin, a black teenager, by George Zimmerman, who pursued Martin out of suspicion at night while armed with a handgun. The same mentality is passed through generations in poor neighborhoods with high levels of crime, where the threat of street violence inspires gang members and regular citizens to arm themselves. 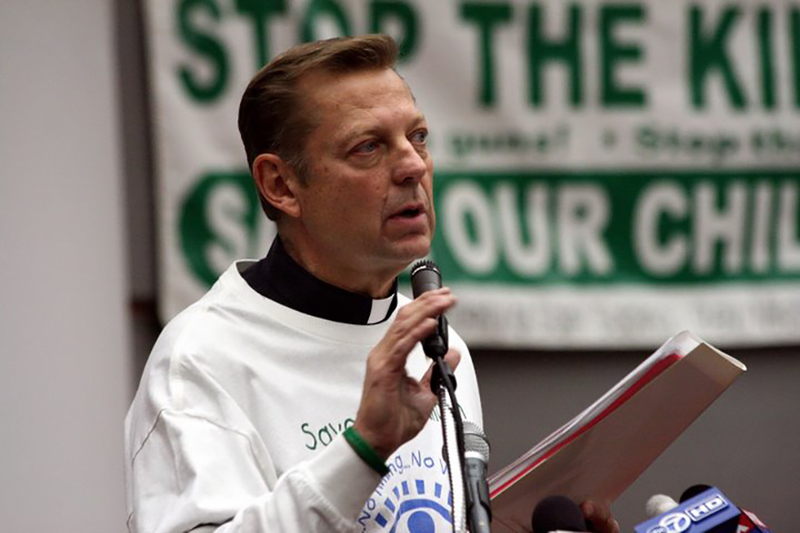 Pastor Michael Pfleger, who heads St. Sabina Church in Chicago, has been a vocal activist against gun violence, doing outreach to gang members as well as conducting annual gun buybacks in an effort to reduce gun deaths. While the City of Chicago has strict regulations on firearms, it’s easy for anyone to drive out of the city and purchase them, he says, adding that the sheer volume of guns enables a cycle of violence. His own foster son was shot down on a street corner in 1998. Yet while some shoot because they feel they must, others shoot simply for the joy of it. Every Saturday, more than 100 people fill a shooting range at Prado Olympic Shooting Park in Chino, Calif., an hour east of Downtown L.A. and the venue for shooting sports during the 1984 Summer Olympics. These days, it’s host to a variety of shooters, including the Norco Running Gun Club, a crew of people led by 52-year-old gunsmith and renowned marksman Jojo Vidanes. I enter the outdoor range to the cracks of percussive pistol ammunition ringing through the air and the aroma of gunpowder and sausages, which are searing to a deep, dark brown on a charcoal grill. Marissa, Vidanes’ wife, serves as the club’s den mother, offering cold drinks from a cooler and flashing grins at familiar faces. She’s among the few female Norco Gun Club members, but in fairness, it’s a pretty diverse group. Strains of Cantonese float through the air, punctuating the soundtrack of English and gunshots. A cadre of young Filipino teammates mingle with a foursome of older white men, telling humorous horror stories about cocksure cops at the range who don’t follow gun safety rules. Elsewhere, Eric Rui Liu, a talented 29-year-old shooter with a lanky frame and a boyish smile, laughs as a white member ambles over, asking him how to tease the Chinese shooters with the word “crybaby.” “Xiao bao bao,” Liu replies. Liu is a star on the International Practical Shooting Confederation circuit, and he plans to teach his kids — a five-year-old boy and a two-month-old girl — how to handle firearms for safety purposes. A part of him also hopes they’ll take up shooting as a passion like their father. He practices aiming and dry-firing (without bullets) at home, and his son already loves running the course timer for Liu as he rehearses in the living room.